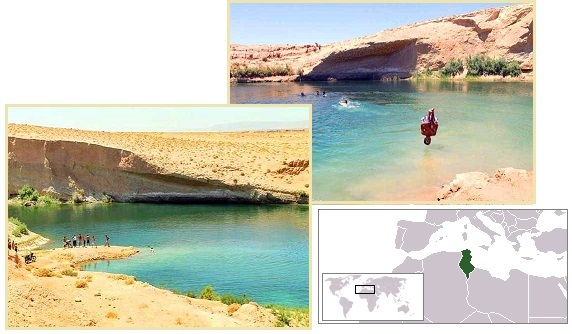 Why would a fresh water lake suddenly appear in the Tunisian desert, as documented by this Pole Shift ning blog? Scientists are dumfounded. According to local authorities, the volume of the reservoir may be one million cubic meters, distributed over an area of ? ?over one hectare, with a depth of ten to 18 meters. The scientists have yet to figure out the cause of the lake, as well as to determine whether it is dangerous to be near him, and it is not necessary to expect the emergence of such "wonders of nature" and in other areas of the country. This has happened before, since the start of the 7 of 10 plate movements. 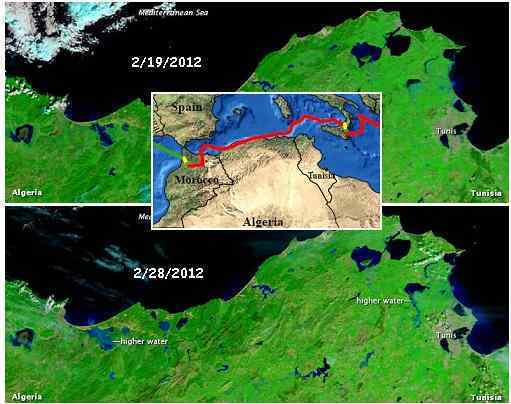 In February 2012 lakes along the coastline of Tunisia widened and deepened, for no apparent reason. Per the Zetas, this can be attributed to the African Roll, as Tunisia loses support when the Mediterranean floor rips apart, and thus droops. These images show the coastal region of northwestern Tunisia and northeastern Algeria. Multiple water bodies appear enlarged on February 28, and two lakes-one near the city of Tunis and the other west of the Tunisia-Algeria border-are clearly higher. ZetaTalk Comment 3/10/2012: Why would land along the coastline of Tunisia be drawn down as Africa rolls? As Africa tears away, dropping to the south, the Mediterranean floor loses support. 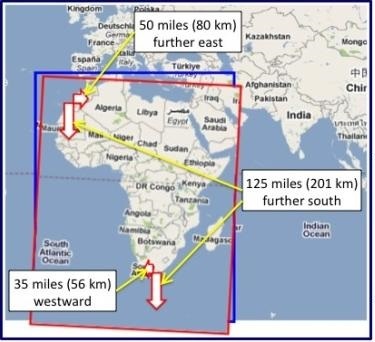 We have explained how the coastline of Algeria will lose 12 feet in elevation as a result of the African roll, as the border of the African Plate slices across the coastline there. Obama has made use of a double recently, due to the many assassination attempts to prevent him from announcing the near presence of Nibiru, aka Planet X. This was detailed recently in Issue 402 of this newsletter. Being a former KGB agent, Putin is certainly familiar with the use of doubles, and has apparently been using them for years! 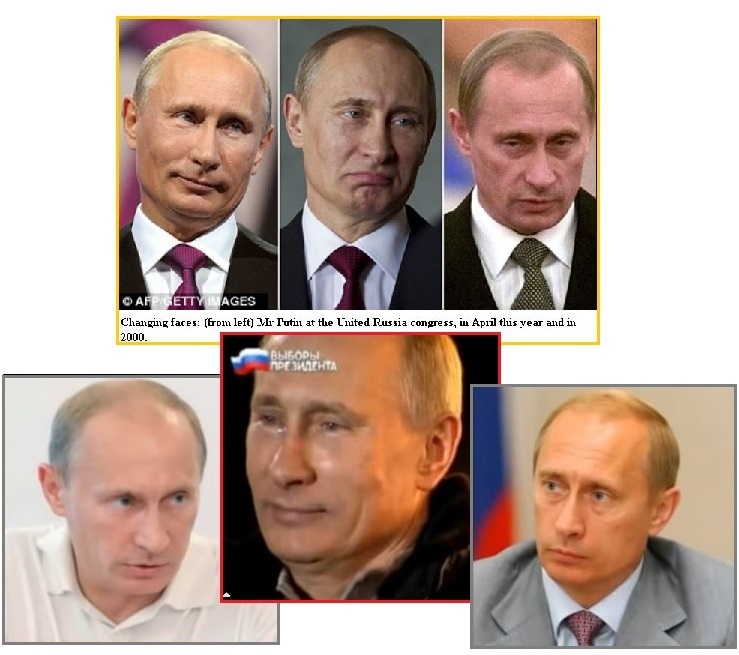 Can you spot the real Putin? In his days as a KGB spy, Vladimir Putin presumably knew a thing or two about the art of disguise. And speculation mounted in Moscow yesterday that the Russian prime minister’s latest transformation is the less-than-subtle result of extensive cosmetic surgery. The 58-year-old’s taut and wrinkle-free appearance at a party conference this week set tongues wagging that he has gone under the knife ahead of his bid to return to the top job of president next March. Last November 10, 2013 we had a newsletter feature called Reading Sir Richard, wherein we examined his agenda in light of the coming Pole Shift. Yes he is living in the Caribbean at present, and is showing where his loyalties lie with his intent to escape into space on his Virgin Galactic flights. But should all else fail, he has a hunting resort in S Africa! Let’s peek again into the mindset of the elite, their hopes and setbacks, by reading Google lately. Last November Google hit the press with several Google barges, which they claimed were to showcase Google technology to the public. This seemed unlikely, but this was their explanation. The Zetas took exception to that explanation. 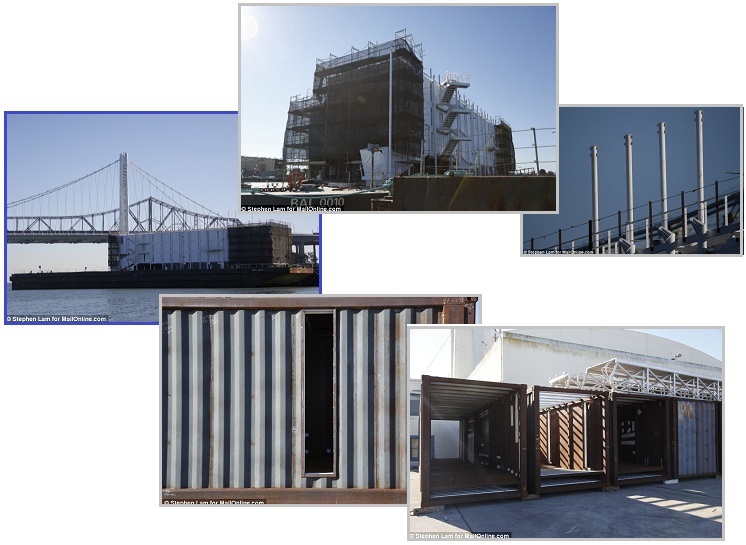 The mystery of exactly what Google is building on a barge close to San Francisco deepened today as a MailOnline investigation uncovered a second structure being built hastily at the top secret site. The huge structure, made up of specially modified shipping containers, looks set to be identical to the first. Another, identical barge has been spotted thousands of miles away on the East Coast in Portland, Maine. Speculation is rampant over what the barges will be used for - with the two most likely reasons being floating showroom 'party boats' to market Google Glass or data centers that can be cooled by sea water. Speculation at first focused on this Google patent from 2009 for a sea-cooled data farm. The project is said to be personally overseen by Google founder Sergey Brin and is being run by the Google X secret facility in Mountain View, California. ZetaTalk Insight 11/9/2013: There are two strong clues as to why these barges, stacked high with shipping containers, are being constructed. 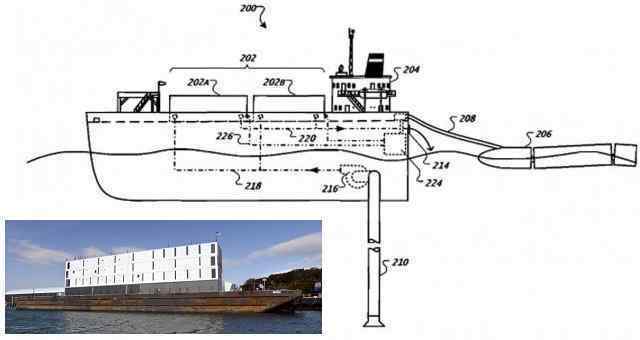 One clue is their 2009 patent showing an ocean cooled barge with electricity generated from wave action. Another clue is the close proximity to Mountain View in the San Francisco Bay, where the Google X facility overseeing the barge development lies. These barges are designed to cool electronics and generate electricity, inexpensively. The narrow windows are to allow some light in for workers to function when electricity generation is at a low ebb. The entire facility is a data center, but why the secrecy? The issue of earthquakes and flooding is a repressed issue, due to the cover-up over the presence of Planet X. Data centers inland are subject to blackouts, and backup generators require fuel, which will become expensive and may even become unavailable. These barges are designed to be self-sufficient, flood and high tide proof, blackout proof, and earthquake proof. 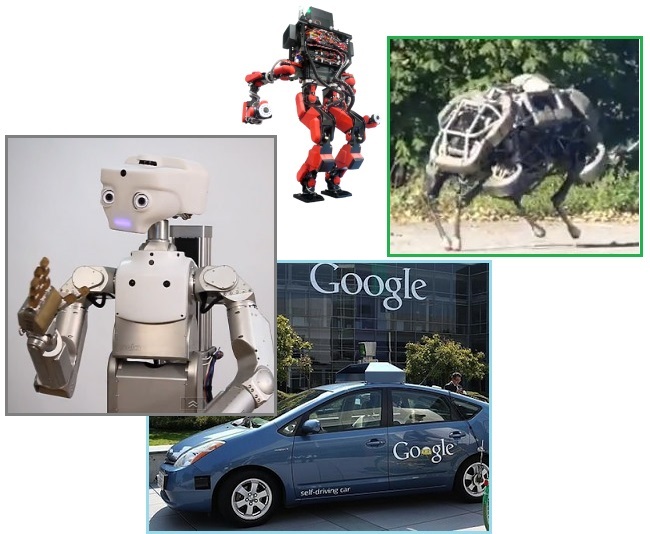 Google was on a rather flamboyant technology binge in December, 2013, with Google Robots, and Google Maps and Google Glass (for an instant and hands-free Internet connection), and Google Drones for delivery of the Internet from space. All this was to serve the elite, per the Zetas. The assumption at that time was that the public would not learn of the pending passage of Nibiru, as Google assumed the announcement by Obama and his partners would be sabotaged. ZetaTalk Insight 12/21/2013: The wealthy elite envision the world of the future, after our predicted Pole Shift, when they will be trapped in their enclaves by starving hoards clamoring to gain entry. There is a risk to opening the gates so that fresh produce or fish can be bartered for items the wealthy have in stock. Items such as vitamins, medicines, and alcohol are being readily stocked by the wealthy in anticipation of these times. To avoid contact with shifty and desperate survivors, send out the robots! ZetaTalk Insight 4/19/2014: All this is not to serve the common man in the Aftertime. The common man will be fishing and gardening and struggling to build housing from the scraps blown about by the Pole Shift winds. Are the wealthy planning to give these survivors Internet access and street surveillance? The elite plan to use these technologies to keep their militia aware of the terrain, and as a direct communication to their militia. The elite will be hunkered down, behind walls and gates, with vast reserves of supplies. They assume an ability to barter for years with the starving hoards at their gates, with an eventual re-establishment of their ranks in a new society. Then Drudge issued a warning in February, 2014 “have an exit plan”, which was taken by many to be about the banking system or Wall Street. Per the Zetas, he was warning the elite that all attempts to assassinate Obama had failed, all attempts to halt the plans for the announcement admitting the pending passage of Nibiru had failed. The elite should brace themselves for an aware public. ZetaTalk Insight 2/1/2014: Drudge speaking in code to those who have heard the private rumors about Obama’s intended announcement re the presence nearby of Nibiru, aka Planet X. What he is saying, in code, is that all attempts to abort the planned announcement have failed. The elite, the ultra-right who consider only themselves in their plans and resent any social welfare programs, should anticipate the common man being informed that they have been lied to lo these many years, and resentful. The common man might refuse their dirty and tiresome jobs, and think of survival camps instead. The common man might ignore their debts and bills, essentially en mass bankruptcy. Drudge is telling his readership, the wealthy readers who comprise his inner circle, to brace for rioting as a result of the announcement, which appears certain to occur, and soon. Did Google take Drudge’s warning to heart? Suddenly they are scrapping their Google barges! Per the Zetas, they took Drudge’s warning to heart! The elite have lost the announcement battle. A Google spokesperson would only confirm that the barge had been sold and declined to reveal any more about the now-defunct project or any such future endeavors. The barge was moved to a different port in Maine so the containers on the barge could be removed and scrapped. The other in Stockton, CA still is sitting at the dock. ZetaTalk Insight 8/9/2014: Why would Google suddenly, without explanation, scrap a viable project? These Google barges had been introduced to the media as a place to showcase technology. Has their technology changed? Have their marketing needs changed? Have they had a global change in management at the top? We challenged their initial explanation by explaining that Google was interested in using tides as a way to generate electricity for floating data centers. Did the Maine tides disappoint? What changed is the political climate and in particular the ability of Obama’s announcement team to prevail against the opposition rallied against it. Prior to 2009 when the patent for such barges was granted to Google, the establishment plan was to deny the existence of Nibiru, aka Planet X, until the last weeks were upon mankind. Thus, the elite could anticipate the common man remaining in their jobs, buying real estate on the coastlines, and at the last minute being ushered into slave labor camps. Then Obama entered the picture and in June of 2012 began to arrange for the people of the Earth to be told the truth. Since then dozens of assassination and smear attempts have been tried against him, all failing. Putin and Xi have been enlisted to help. NASA began educating the public on the nature of roving planets on odd orbits, and the abundance of life bearing planets in the Universe. If Google planned to use these floating barges as self-sufficient data centers, why scrap them now? The logic is that if the announcement could be defrayed, prevented from occurring, existing corporations would need to be braced for the eventual outcome of the grid being taken down by major earthquakes. This was in the context of an ignorant public. But if the announcement cannot be stopped, then the public will read ZetaTalk or view such odd devices as the barges with suspicion, and perhaps attempt to board and loot whatever the suspicious barges might be holding, suspecting it of being a refuge for the elite, self-sufficient and able to withstand hurricane force winds and high tides. To avoid attracting this type of attention, the barges are being scrapped. Some dramatic incidents caused by lightning have occurred recently. Is this on the increase? And if so, what is causing this? The Zetas have warned that during the hour of the Pole Shift, lightning will increase. They have also warned that rock under stress facilitates the movement of electricity through the rock, causing arcing from the ground to the charged tail of Planet X. When over or near water, this is increased, thus Air France 447, MH 370, and the NSA problems with their new data warehouses in Utah. During the stress of the 7 of 10 plate movements, and certainly during the plate stress during the crustal slip during the hour of the Pole Shift, lightning will increase. ZetaTalk Prediction 7/15/1995: Static electricity in the atmosphere will not increase during the approach of Planet X, nor afterwards, but during the passage lightning will seem to be almost constant in some places. ZetaTalk Warning 5/21/2011: Cave men recorded Thunderbolts of the Gods on their cave walls, because of the intense lightning storms that accompanied pole shifts. This is not a phenomena that will merely appear during the pole shift itself due to turmoil in the upper atmosphere, but can also be expected anytime rock is under great compression. ZetaTalk Insight 7/25/2014: On July 25, 2014 an EasyJet landing in Spain close to noon at 10:10 am made an emergency landing as it had been devastated by lightning, all 116 aboard saved, thus. Planes are protected from lightning strikes, but this assault was considered so devastating the pilot was taking no chances. The assault was sudden, unexpected, and once again near water as both Barcelona and the emergency landing were along the coastline with the Mediterranean. As with the European radar outages on June 5-10, 2014 in the afternoons, the timing was when the Sun was overhead, close to noon. Facing Planet X, direct arcing to the charged tail occurred, and such lightning storms will likewise be on the increase, increasing devastation for air travel. True to the relationship between rock stress, either due to compression or stretch, are the dramatic lightning storms in Croatia in June and during the Chicago Derecho in July, 2014. Croatia is within the stretch zone affecting the Eurasian Plate, and near the Mediterranean, and Chicago of course is in the Seaway stretch zone and right on Lake Michigan. Dubrovnik was besieged by a thunderstorm earlier this month, with photographer and storm chaser Daniel Pavlinovic capturing these stunning images of the lightning striking the ocean then moving on to houses within the Croatian city. Pavlinovic first took pictures of the fork as they approached the city, then carried on shooting as the bolts made landfall. "It was a severe thunderstorm with lightning striking houses and trees," he said. 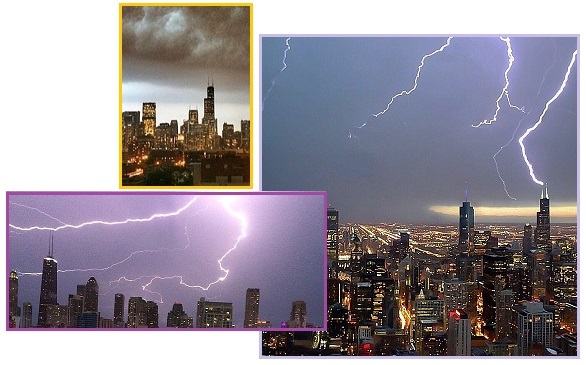 A dangerous type of storm called a derecho hit the Great Lakes area, with lightning striking Chicago's Willis Tower as heavy clouds hung overhead. So what, exactly, is a derecho? It's a large group of thunderstorms with winds that can grow as strong as 50 to 100 mph, capable of affecting areas several miles wide and more than a hundred miles long. Most common in the Spring and Summer, a derecho reaches a much larger region than a tornado, and it typically leaves far more damage in its wake. The North American continent is under a bowing stress, per the Zetas, with the center of the bow at San Diego. No surprise that this rock stress would arc on the beach there, though these occurrences are rare. And in Sweden, a lightning strike so intense it sunk a sailboat. Statistically deaths from lightning, in the US, have gone down since 2006, but be warned – storms, humid air, and rock stress are not a good combination. Stay indoors and stay safe. Lightning struck 14 people, killing one, as rare summer thunderstorms swept through Southern California. Some appear to have been in the water and others on the beach's famed boardwalk. Lifeguards performed CPR on at least one person pulled from the water. The unusual weather came from monsoon moisture that brought a line of brief but fierce afternoon thunderstorms to the region. Since 2006, there have been 277 people killed by lightning strikes in the United States. 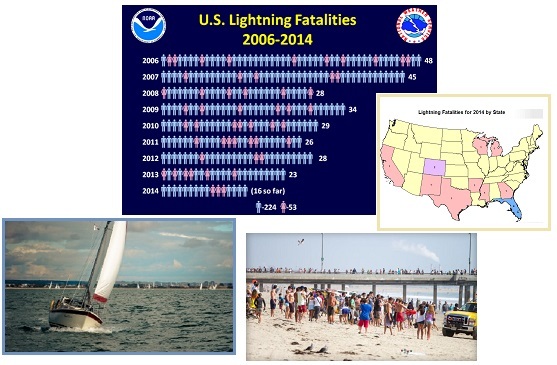 The number of fatal lightning strikes has declined in recent years. It was an unmanned boat moored in the lake. Apparently the lightning struck a huge hole in the boat and it sank incredibly quickly. The Zetas have predicted that dark lightning will be on the increase too, as detailed in Issue 344 last May, 2014. Dark lightning - upper atmosphere lightning where the flash and crackle are missing - occurred off the coast of Mexico recently, lower than usual and a first. 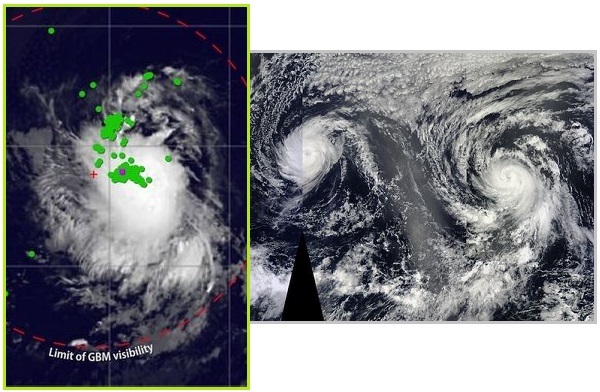 Before the Hawaii-bound storm Julio strengthened into a hurricane, a NASA satellite spotted a high-energy flash of "dark lightning" coming from the swirling clouds. “As far as I know, a TGF from a tropical storm has never been reported before," Michael Briggs, a member of the team in charge of Fermi's Gamma-ray Burst Monitor (GMB) at the University of Alabama in Huntsville, said in a statement from NASA. ZetaTalk Explanation 4/14/2013: Upper atmosphere lighting is traditionally found close to the Equator as this is where air turbulence is highest. The globe turns, with the air above the poles theoretically still, as the Earth does not move under the air mass there but slightly. But the air above the Equator is moving rapidly, as the Earth under the air masses there is moving rapidly. Why would the phenomena of upper atmosphere lightning now be moving to the northern latitudes? If rapidly moving air masses, one over the other, is the cause, then surely the wobble, which has been increasing would increase the incidence. And it has!